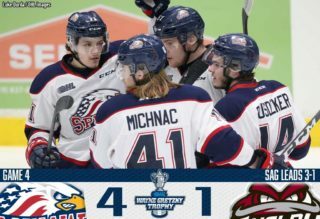 The Saginaw Spirit set a new single game franchise record in the postseason, scoring 10 times in a commanding victory over Sault Ste. Marie. The Spirit scored five first period goals, eventually climbing out in front 8-0 before Sault Ste. Marie’s Mac Hollowell (2) scored the lone goal for his club. Nicholas Porco (1, 2) and Ryan McLeod (2, 3) each finished with two goals and two assists while Blade Jenkins (3, 4) had two goals and an assist. 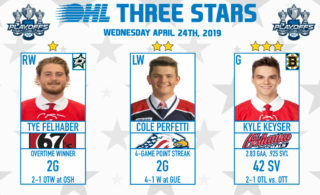 Owen Tippett (8), Brady Gilmour (1) and Mason Millman (1) each finished with a goal and two helpers while Camaryn Baber (2) rounded out the Saginaw scoring. 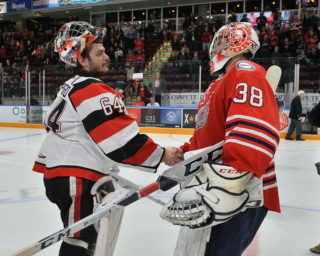 Ivan Prosvetov stopped 42 of 43 in goal as the Spirit was actually outshot 43-42 when all was said and done. 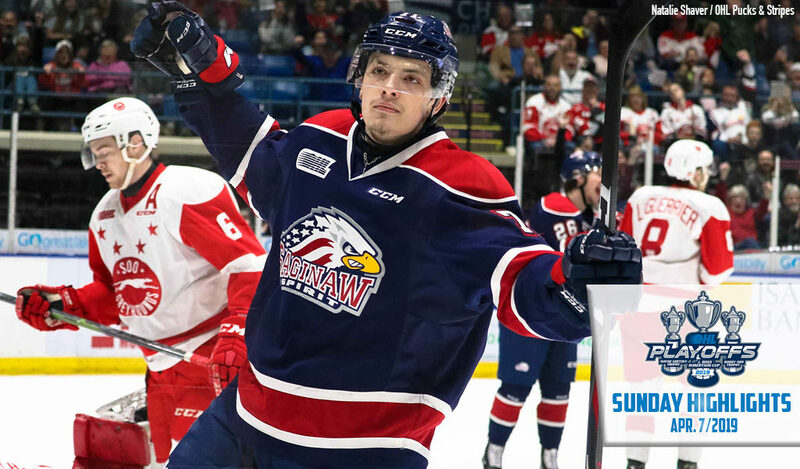 Nine of Saginaw’s 10 goals came at even strength as the Spirit finished 1-for-9 on the power play. The Spirit win came before a crowd of 4,270 at the Dow Event Center. The Greyhounds look to come up with a response at home Tuesday night as the series shifts to Sault Ste. Marie for Game 3. Five goals in the opening six minutes of the third period blew Game 2 wide open as the London Knights trounced visiting Guelph 7-0 to take a 2-0 series lead. Vegas Golden Knights prospect Jordan Kooy stopped all 27 shots he faced while Kevin Hancock (3, 4) scored twice and added an assist while going 12-for-13 in the faceoff circle. Columbus Blue Jackets prospect Liam Foudy (3) scored a highlight reel goal and added an assist while other London markers came from Matvey Guskov (1), Josh Nelson (2), Adam Boqvist (7) and William Lochead (2). The Knights outshot the Storm 36-27, going 2-for-4 on the power play. The Storm will look to turn things around on Monday night as they return to home ice for Game 3. The Niagara IceDogs carried the play for a second straight game, outshooting the visiting Oshawa Generals 42-25 in a 5-1 victory. The IceDogs take a 2-0 series lead as Minnesota Wild prospect Ivan Lodnia (2) earned first star honours with a goal and two assists while Jason Robertson (4, 5) also had two points, picking up two goals and one helper. Matt Brassard (1) scored against his former club while Philip Tomasino (4) rounded out Niagara’s goal scorers. Former Generals captain Jack Studnicka picked up a pair of assists while Stephen Dhillon stopped 24 of 25 in goal. Serron Noel set up Allan McShane (3) for Oshawa’s lone goal midway through the second period while goaltender Kyle Keyser was busy again, turning aside 37 shots. The Generals will look for new life on Tuesday night as the series shifts to home ice for Game 3. 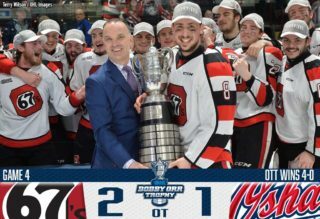 The Ottawa 67’s made the most of their opportunities, scoring five times on 25 shots to blank visiting Sudbury 5-0 behind a 27-save shutout effort from goaltender Michael DiPietro. Ottawa takes a 2-0 series lead behind a two-goal showing from Arizona Coyotes prospect Noel Hoefenmayer (4, 5) on the blue line while overage shooter Tye Felhaber (4) finished with a goal and two assists. Lucas Chiodo (5) and Austen Keating (1) also struck for Ottawa while Kyle Maksimovich had a pair of assists. Ottawa scored some very nice goals to solve Sudbury’s Ukko-Pekka Luukkonen on Sunday afternoon. The series shifts to Sudbury for Game 3 on Tuesday as the Wolves look to get something going on home ice.